The Human Skeletons from Herjólfsnes Niels Lynnerup* Abstract - When the skeletons from Herjólfsnes were examined after excavation in Greenland, it was hoped that they might shed light on the fate of the Norse colonies there. They were examined at a time when biological anthropology was very much concerned with issues such as race, racial intermixture, and racial degeneration. For the examining scientists, the skeletons from Herjólfsnes did seem to support theories of an isolated, degenerate, and sickly population, doomed to extinction. Indeed, some of the results of these analyses still crop up in present-day publications. *Laboratory of Biological Anthropology, Panum Institute, Blegdamsvej 3, DK-2200 N Copenhagen, Denmark; n.lynnerup@ antrolab.ku.dk. Introduction According to the Icelandic sagas, Eric the Red founded the Greenlandic Norse settlement in AD 986 (Bekker-Nielsen 1967:141–166). This fi rst settlement (the Eastern settlement) was augmented with another one (the Western settlement), situated about 400 km north of the fi rst one. The land was uninhabited, as the Thule Eskimos had not yet spread to the southwestern part of Greenland. A measure of the prosperity and the obvious steady contact with Norway, and thereby Iceland, was the ordination of a bishop to Garðar in the Eastern settlement in AD 1124 (Arneborg 1991). It seems, however, that contact with Iceland and Norway gradually faded, although the settlements were subjected to the Norwegian crown in AD 1261. According to written sources, the Western settlement lay waste in approximately AD 1360. The last known written testimony from the Eastern settlement dates to AD 1408 (GMH III:145–150). It has been assumed that the Eastern settlement was fi nally depopulated a century later (Meldgaard 1965). The decline of the Norse settlements has always been foremost among the Greenlandic Norse issues studied. Indeed, this question has been presented almost as an enigma, hinting at some inexplicable and dramatic event veiled by the passage of time. Consequently, the explanations have also been dramatic, ranging from sweeping epidemics to pirate and Eskimo attacks or racial degeneration. When the Danish king dispatched Hans Egede to Greenland in 1721, a primary aim was to investigate whether there were any isolated communities with descendants of the old Norse settlers left (Egede 1738). Egede did not fi nd any living Norse, but he did observe the Norse ruins in the Qaqortoq Fjord now known as Hvalsey Church (GHM III:730), and there he carried out the fi rst recorded excavations of a Norse site (Albrethsen 1971), setting the stage for many later archaeological excavations of Norse sites in Greenland. Some of these excavations have revealed the remains of the Norse themselves. The fi rst major fi nd of Norse skeletal material was made at Herjólfsnes in 1921 as a result of a controlled excavation (Fig. 1), and the anthropological examinations resulted in a comprehensive publication in Meddelelser om Grønland. The author, the Danish anatomist, Professor F.C.C. Hansen, felt that he had solved the enigma of why the Greenland Norse disappeared. The Excavations at Herjólfsnes (E111, Ikigait) The fi rst fi nd at this site was a funeral stone with runic inscriptions found by deFries in 1830. It was sent to the Danish National Museum, where it is now on display (GHM III:801, Mathiesen 1831, Nørlund 1924). O. Kielsen performed the fi rst excavations in 1840 (GHM III:Pl. 3, Pingel 1842). During a test excavation the year before, “a cranium with hair” had been found (Pingel 1842). It should be noted that the site was exposed to severe erosion by the sea, resulting in constant exposure of skeletal material and coffi ns. Records indicate that some of this hair was sent to Copenhagen, and it was determined that it derived from a Norse settler (Pingel 1842). Among other objects there were “several pieces of wooden coffi ns, with skeletons lying inside, bits of shrouds, a couple of wooden crosses, several tombstones ...” (GHM III:801). Neither the hair nor other anthropological material from this excavation has been located. H.J. Rink conducted topographical studies in 1853 (Rink 1853), and Gustav Holm is reported to have found a coffi n at the site in 1880: “I had excavations conducted here, and, as before, found skeletons in cloth and coffi ns.” (Holm 1883:136). The skeletons were apparently not secured, but Rink marked their position on his map (Holm 1883). In 1900, Gustav Meldorf, the district medical offi cer, excavated some skeletal material at the site and noted numerous coffi ns and shrouds (Meldorf 1912). Because of the ongoing erosion, nearly all of the south part of the churchyard had vanished into the sea. Even parts of the church ruins had been eroded by the sea. The coastline formed a small cliff, from 2009 Special Volume 2:19–23 Norse Greenland: Selected Papers from the Hvalsey Conference 2008 Journal of the North Atlantic 20 Journal of the North Atlantic Special Volume 2 beneath which several partly exposed human bones were observed. Meldorf (1912) noted: “The bones lay in a horizontal position and noticeably close to one another.” He found several crania, and the skull (cranium and mandible) of one individual was brought to Denmark. Some garments, including a cap, were shipped to Denmark (Nørlund 1924). Mylius- Erichsen visited the site in 1905. Although there is no report of any excavations, two crania at our Laboratory are said to be from the Mylius-Erichsen visit. The two crania are also mentioned in F.C.C. Hansen's anthropological study of the material from E111 Herjólfsnes (Hansen 1924). However, the boxes containing the crania are marked “Meldorf.” There is even some inconsistency in the Laboratory’s acquisitions journal; while the material is entered as being from Mylius-Erichsen, there should also be some postcranial material. However, no such postcranial material has so far been identifi ed in our Laboratory. The main excavations were conducted by Poul Nørlund in 1921 (Nørlund 1924; Figs. 2, 3). According to Nørlund (1924), the fi nd comprised remnants of approximately 110–120 burials. However, many burials were in such poor condition that Figure 1. One of the Herjólfsnes skeletons under excavation in 1921. Photograph © Poul Nørlund, National Museum of Denmark. Figure 2. The Herjólfsnes church after excavation in 1921. To the right is Guðveig’s empty coffi n. Photograph © Poul Nørlund, National Museum of Denmark. 2009 N. Lynnerup 21 no remains could be removed, especially the material in the upper layers. Nørlund estimated that about 200 burials were identifi ed in the surveyed area. Nørlund noted that “within these areas, burials were generally closely packed, often in three or four layers” (Nørlund 1924:59). He managed to retrieve many pieces of clothing which had been wrapped around the corpses (Figs. 4, 5). These items became the spectacular fi nds from Herjólfsnes because of their excellent state of preservation (indeed, the Herjólfsnes garments are almost the only known extant medieval clothing from Greenland). Nørlund only found traces of two burials inside the church. One burial outside the church (the so-called “Gudveg’s grave”), close to the north wall of the choir, was a coffi n burial containing a rune stick. Two fragments of a yellowish substance were also found, and Nørlund (1924) interpreted them as the remains of two individuals. Nørlund found no traces of an earlier church, but burials had been found at both the east and west ends of the church, directly below the church foundations. Nørlund therefore believed, also on the basis of architectural considerations, that there had been a burial ground and a church before the construction of the church represented by the extant ruins (Nørlund 1924:50). Dating was primarily based on the analysis of clothing, including hoods and caps. The garments have been dated to the beginning of the 15th century, on the basis of the style, allowing for the dissemination of fashions from Europe, presumably through Norway (Nørlund 1924). In fact, the skeletal material from Herjólfsnes is the only Norse material from Greenland which can be dated with a reasonable Figure 4. Hood. Photo taken at the National Museum during post-excavation analysis. Note the set of teeth inside the hood. Photograph © National Museum of Denmark. Figure 3. Excavations at the Herjólfsnes church and cemetery in 1921. Photograph © Poul Nørlund 1921, National Museum of Denmark. Figure 5. Dresses from Herjólfsnes after conservation. Photograph © National Museum of Denmark. 22 Journal of the North Atlantic Special Volume 2 degree of certainty on the basis of associated grave goods. This dating was borne out by later radiocarbon analyses (on both cloth and skeletal material), which suggest a range between 1400–1450 AD (Arneborg et al. 1999, Lynnerup 1998). F.C.C. Hansen’s Anthropological Analyses of the Herjólfsnes Skeletal Material For Hansen, the skeletal material might hold the key as to why the Norse colonies had foundered. After all, these were the remains of some of the last Norse (according to Nørlund’s interpretation of the dating of the church). Nørlund had secured the remains of 26 individuals, comprising both females, males, and subadults. Hansen performed an extremely diligent study of these remains, and his publication is still very readable and holds much detailed information. Three things struck Hansen: the skeletons were small, refl ecting small people; they seemed to have died before reaching old age; and several of the skeletons were marked by diseases. Concerning stature, Hansen felt certain that there had been a marked decrease in stature, and he linked this with a hypothesis of racial degeneration, saying: “The tall Northern race degenerated into small, slight, and delicate women, and correspondingly slightly taller men” (Hansen 1924:465). However, Hansen used different mathematical equations to derive calculated stature from bone lengths than we do today (and which result in slightly higher statures), and furthermore, Hansen made some subjective subtractions on the basis of perceived scoliosis and rachitic changes (Hansen 1924). Implicit also in Hansen’s conclusion is the idea that the Norsemen, at the beginning of the settlement period, were tall and powerfully built (e.g., “The vigorous Northern race that originally colonized Greenland” [Hansen 1924:520]). This description is unfounded, and later analyses of the stature of skeletons from various Danish pre-historical and historical periods (Bennike 1985) indicate that the people of the Viking Age were smaller than later medieval populations (see also Scott et al. 1992). Furthermore, Hansen (1924) concluded that there had been a “striking decrease ... of the size of their skulls.” Since Hansen and many anthropologists of his day saw cranial size, and hence cranial capacity, as directly related to brain size, and brain size as directly related to mental capacity, this meant that the Norse “race” experienced a “reduction of the extent and capacity of intellectual life” (Hansen 1924:434), ultimately paving the way for the Norse extinction. The linkage of mental capacity with brain size and cranial size has since been abandoned (Gould 1981). The pathological changes that Hansen identifi ed, e.g., rachitis and scoliosis, were based on a direct assessment of what he found to be bent warped bones. Hansen did not have the benefi t of large comparative collections of archaeologically found skeletal remains, as we have today. When comparing the Herjólfsnes material to other archaeological skeletal material, especially bones which have lain in a wet turf environment, it becomes clear that the Herjólfsnes bones have been taphonomically influenced, so that they have, to some degree, become warped and shrunken. This has been ascertained by other researchers (Bröste et al. 1941, Fischer-Møller 1942, Krogh 1982, Lynnerup 1998). Hence, any measurements or observations should be made with great caution. While there is no doubt that the late Norse were small, they were not pathologically small. Of great interest was whether there had been an admixture of Eskimos. Hansen stated that: “... none of the skulls showed characters, not even in the jaws or facial regions, that indicated a possible intermixture of Eskimo blood!” (Hansen 1924:430). This still holds true, and moreover, no Norse traits have been found in the pre-contact Thule Eskimo skeletal material (Balslev-Jørgensen 1953, Meldgaard 1965, Scott et al. 1992). Adjunct to the concept of admixture were also other concepts of racial purity and degeneration. While verging on racism in today’s view, such hypotheses were quite normal among anthropologists in Hansen’s day. Thus, when Hansen concluded that the skeletons showed evidence of degeneration and hence had become “a race of small people, with little strength, physically weakened, and with many defects and pathological conditions” (Hansen 1924:520), the ready explanation was isolation “as regards race hygiene” (Hansen 1924:520). 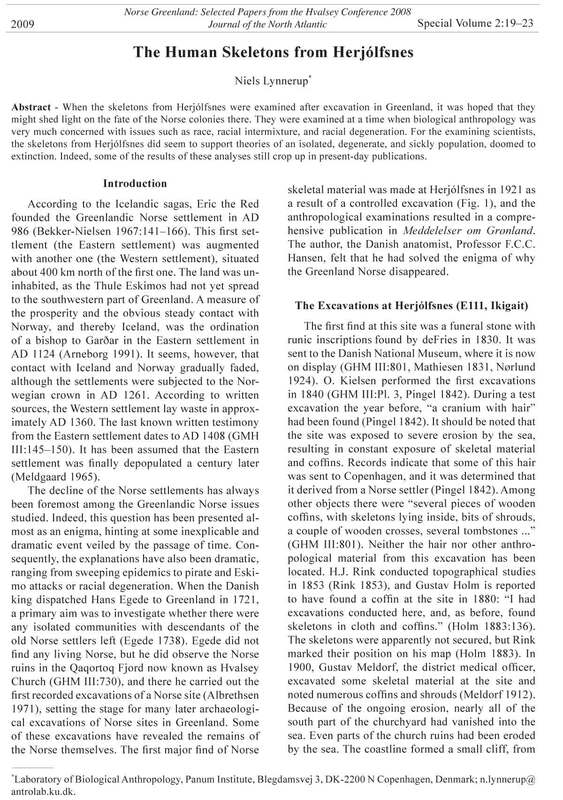 Conclusion Issues of race and the fear of population degeneration that were very much in the foreground in the 1920s and 1930s pervade Hansen's analyses of the Herjólfsnes material. In other words, the fi ndings of Hansen, though the result of diligent and arduous study, were quickly discredited by the next major anthropological studies in the 1940s, when the Herjólfsnes material was reassessed (Bröste and Fischer- Møller 1941, Fischer-Møller 1942). Hansen’s major problem was that he did not have comparable archaeologically derived skeletal material, which would have allowed him to see that many of the changes he saw most probably were the result of diagenetic degradation. He also interpreted his results following the pervading scientifi c views of his day, namely with regards to the concepts of race hygiene and racial degeneration. While somewhat primitive by the standard of our modern genetic knowledge, it must be borne in mind that scientifi c interpretations to some degree will always refl ect the scientifi c 2009 N. Lynnerup 23 consensus at the time. In this light, it is perhaps not surprising that many present-day theories on the disappearance of the Norse focus on climate change. Interestingly, the fi rst argument for climate change was presented by Nørlund during his excavations at Herjólfsnes. Nørlund noted how the bodies lay in permafrost, yet many had clearly been disturbed by plant roots (Nørlund 1924). The Herjólfsnes skeletal material, now being analysed by stable isotope and ancient DNA analyses, may still yield new insights. Literature Cited Albrethsen, S.E. 1971. Træk af Nordboarkæologiens historie. Tidsskriftet Grønland 10:298–302. Arneborg, J. 1991. The Roman church in Norse Greenland. Acta Archaeologica 61:142–150. Arneborg, J., J. Heinemeier, N. Lynnerup, H.L. Nielsen, N. Rud, and A.E. Sveinbjornsdottir. 1999. Change of diet of the Greenland Vikings determined from stable carbon isotope analysis and C-14 dating of their bones. Radiocarbon 41:157–168. Balslev-Jørgensen, J. 1953. The Eskimo skeleton. Meddelelser om Grønland 146(2):1–154. Bekker-Nielsen, H. 1967. Greenland sagas. Pp. 139–182, In K.Krogh (Ed.). Viking Greenland. National Museum of Denmark, Copenhagen, Denmark. Bennike, P. 1985. Paleopathology of Danish Skeletons. A Comparative Study of Demography, Disease, and Injury. Akademisk Forlag, Copenhagen, Denmark. Bröste, K., K. Fischer-Møller, and P.O. Pedersen. 1941. The Medieval Norsemen at Gardar. Meddelelser om Grønland 89(3):1–62. Egede, H. 1738. Omstændelig og Udførlig Relation, Angaaende den Grønlandske Missions Begyndelse og Fortsættelse. Joh. Kristian Groth, Copenhagen, Denmark. Fischer-Møller, K. 1942. The Medieval Norse settlements in Greenland: Anthropological investigations. Meddelelser om Grønland 89(2):1–82. Gould, S.J. 1981. The Mismeasure of Man. W.W. Norton and Co., New York, NY, USA. Grønlands Historiske Mindesmærker (GHM) I–III. 1838–45. First edition. Det Brünnichske Forlag (reprinted 1976 by Rosenkilde and Bagger), Copenhagen, Denmark. Hansen, F.C.C. 1924. Anthropologia medico-historica Groenlandiæ antiquæ I. Herjolfsnes. Meddelelser om Grønland 67:293–547. Holm, G. 1883. Beskrivelse af Ruiner i Julianehaabs Distrikt. Meddelelser om Grønland 6:57–145. Jones, G. 1986. The Norse Atlantic Saga (2nd Edition). Oxford University Press, New York, NY, USA. Krogh, K. 1982. Erik den Rødes Grønland. Nationalmuseets Forlag, Copenhagen, Denmark. 266 pp. Lynnerup, N. 1998. The Greenland Norse. Meddelelser om Grønland, Man and Society Series 24. 149 pp. Mathiesen, J. 1831. Letter to “Den Kongelige Kommission for Oldsagers Opbevaring.” The Norse Archives, National Museum of Denmark, Copenhagen, Denmark. Meldgaard, J. 1965. Nordboerne i Grønland. Munksgård, Copenhagen, Denmark. Meldorf, G. 1912. Fund af Ligklæder paa Kirkegaarden ved Ikigait og Bidrag til oplysninger om Nordbodragter i Grønland i Middelalderen. Unpublished report. The Norse Archives, National Museum of Denmark, Copenhagen, Denmark. Nørlund, P. 1924. Buried Norsemen at Herjolfsnes. Meddelelser om Grønland 67(1):1–270. Pingel, C. 1842. Antiquariske Efterretninger fra Grønland. Annaler for Nordisk Olkyndighed. Det Kgl. Nordiske Oldskrift Selskab 1842–43. Copenhagen, Denmark. Rink, H.J. 1853. Østprøven eller Ikigait med Ruinerne af det gamle Herjulsnæs i Grønland. Unpublished map. The Norse Archives, National Museum of Denmark, Copenhagen, Denmark. Scott, G.R., C.M. Halffman, and P.O. Pedersen. 1992. Dental conditions of medieval Norsemen in the North Atlantic. Acta Archaeologica 62:183–207.